Who Needs a Cubicle Instead of a Private Office? Home→Cubicles→Who Needs a Cubicle Instead of a Private Office? A private office cubicle is a modular workstation that’s very similar to your average cubicle, except that it’s larger and more private in order to accommodate all the needs of an employee who would otherwise require a full-fledged sheet rocked private office. In that way, they provide a good middle ground between the typical cubicle and the conventional office. Like regular cubicles, they have a high level of customization, in that they can be built to any desired size and can be outfitted with built-in wrap-around storage, task lighting, and wiring. They also offer a mobility simply not possible with conventional offices: if you ever move to another office, the impermanent walls and other features can be disassembled and move with you. Because they are essentially office cubicles that mimic sheet-rocked private offices, the most notable feature of private office cubicles are their high walls, which help those who especially require sound privacy to work effectively throughout the day. Have you ever worked next to a coworker whose voice carried heavily across cubicle partitions during phone calls? Couldn’t stop focusing on a neighbor’s persistent cough once you became aware of it? These are environmental distractions that a private office cubicle can really drown out, especially when you select full-height walls and choose from our hundreds of materials for one that has the right sound-absorbing qualities. This ability to select glass, metal, laminate, or fabric, among many other materials, is a choice you won’t find with a conventional private office. Naturally, when you opt for a private office cubicle to carry you through your workday, it would make sense to include a door with your walls in order to complete the room-like feel of your work-space. A door not only adds to your full privacy, but it can also adjust the level of privacy you need. An open door can be a way to welcome other office staff to interact with you when your workday permits while closing your door is a non-verbal way of letting others know that you don’t want to be disturbed. What if that neighbor’s persistent cough is contagious? Whether hinged or sliding and no matter the material, a door allows the ability of your private office cubicle to reduce your risk of coming into contact with spreadable airborne pathogens. Whether you’re on the fence about including a physical door, or if you’d like to see how one can improve the privacy of your work-space, be sure to come by our showroom to see our private office cubicle models. Along with walls and a door, conventional private offices often have windows and other glass paneling in order to filter in the natural and ambient light. Decorative paneling is also a common feature, adding a touch of class and sophistication especially to an executive office. In the same vein, private office cubicles can also offer these paneling amenities as well. In fact, glass tends to be a very popular feature of private office cubicles, suggesting an openness and connection to workplace surrounding while also, demonstrating a need for boundaries. If visibility is a concern, translucent and frosted glass panels can be strategically integrated into your private office cubicle. software engineers, data scientists, visual designers, and so on—are said to provide a conduit between management and consumer, and they’re tasked with doing the most difficult jobs in their companies in terms of quality, not quantity. Since the quality of their work relies heavily on a lack of distractions, this kind of employee might require a private office cubicle. In one study, 58% of HPEs working in an open office agreed to the need for private spaces for problem-solving, with 54% of them reporting their office environment to be too distracting. Generally, the cost of a private office cubicle depends on such factors as space planning and choice of materials, and since one office can differ greatly from another, it’s best to know the specifics of how private office cubicles will directly meet your physical office needs. That being said, the costs to customize your private office cubicle could run higher than the cost of building out an actual, Sheetrock private office. But the relatively ease of assembling and disassembling means that if you ever move offices, your private office cubicle can come with you and you can get back to a distraction-free workday quickly. Another benefit: under section 179 of the IRS tax code, the full expense of office furniture—which includes your private office cubicles—can be written off in the year that you purchase them, further making them a worthy long-term investment. 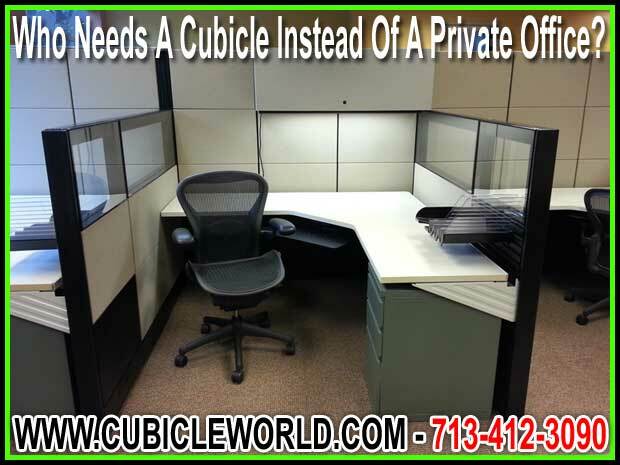 Call us today at Cubicle World so that we can discuss how to match you with the perfect private office cubicles. We offer a one-year warranty on our custom-designed and -built cubicles for the quality craftsmanship and labor we put into our products. Even when your warranty no longer applies, we provide an affordable repair program for any products you’ve purchased from us.